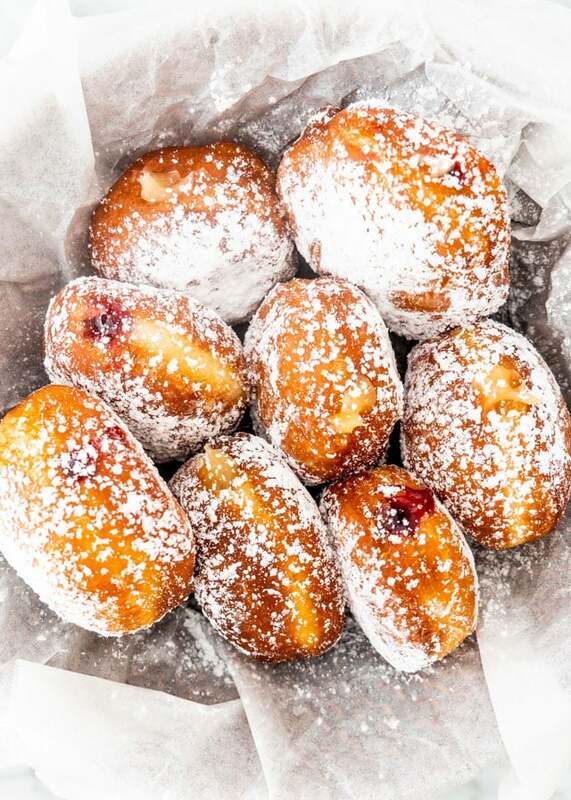 These homemade Paczki are soft, pillowy delectable morsels filled with jam, custard or lemon curd! Paczki are traditional Polish donuts, popular on Fat Tuesday aka Mardi Gras. These Paczki are the bane of my existence. I simply love them. I’ve been making them and eating them for years. They are popular around Mardi Gras which simply means Fat Tuesday. Fat Tuesday is the day before Ash Wednesday which is a day of preparation for the penitential season of Lent. 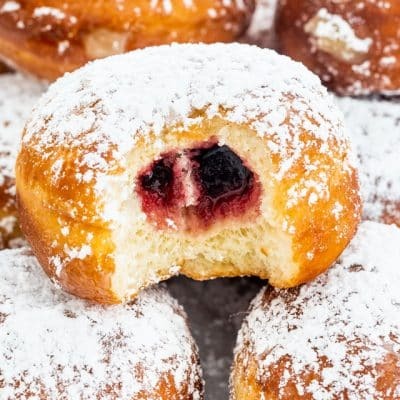 Paczki are Polish deep-fried donuts that are filled with some sweet filling such as jam, custard, lemon curd or chocolate. They are usually covered with powdered sugar, icing, glaze or dried orange zest. They are simply and utterly delicious. Paczki are made of a very rich, sweet yeasty dough which consists of eggs, butter and milk. Regular donuts are not usually as rich. 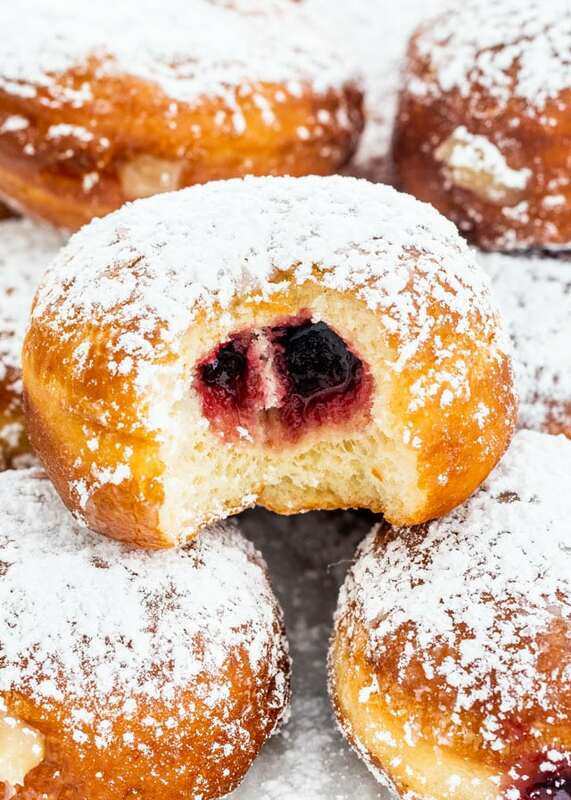 While donuts usually have a hole in the middle, Paczki don’t and instead are filled with jam or other goodies. My recipe for making Paczki couldn’t get any easier and it really is fool proof. To make the dough there are two simple steps. Mix the wet ingredients together, then add this to the flour and mix. Make sure your milk is lukewarm. I usually pop it in the microwave for about a minute. You don’t want the milk too hot because this will kill the yeast, so make sure it’s just warm to the touch. While you could knead this by hand, if you have a stand mixer, add the flour and the milk/egg mixture to the bowl of your mixer and using the dough hook mix until the dough comes clean from the sides of the bowl. The dough should be very malleable and soft. Place it in an oiled bowl then cover it with plastic wrap or a clean kitchen towel and let it rise until doubled in size. I usually place my bowl in a warm oven, this will speed up the rising process. On a floured surface start rolling the dough until it’s about 1/4 to 1/2 inch (1 cm) in thickness. This dough should make about a 16 donuts. Using a glass, or if you want a cookie cutter, start cutting out rounds from the dough. Repeat this with remaining dough until there’s no dough left. Place the donuts on a baking sheet lined with parchment paper and let them rise until doubled in size. Fry them in hot oil until they’re golden brown on both sides. Watch them carefully because they fry quickly. Place them in a bowl lined with paper towels and allow them to cool until you can easily handle them. All that’s left to do is to fill a piping bag with your favorite filling, fill them then sprinkle or roll them through some powdered sugar. That’s the great thing about Paczki. You can fill them with anything! I love filling mine with various jams such as seedless raspberry or strawberry. I’ve even filled them with Saskatoon berry jam, which is to die for. Other favorite fillings of mine include lemon and lime curds, custards, chocolate cream or Nutella. However, the sky’s the limit though, when it comes to Paczki. Did you know they make Pina Colada and Mocha Paczki, just to name a few! How about a chocolate Paczki! Because they’re just that good! When I worked in Detroit, there wasn’t a Fat Tuesday that went by without someone bringing in a box of Paczki for everyone to enjoy! 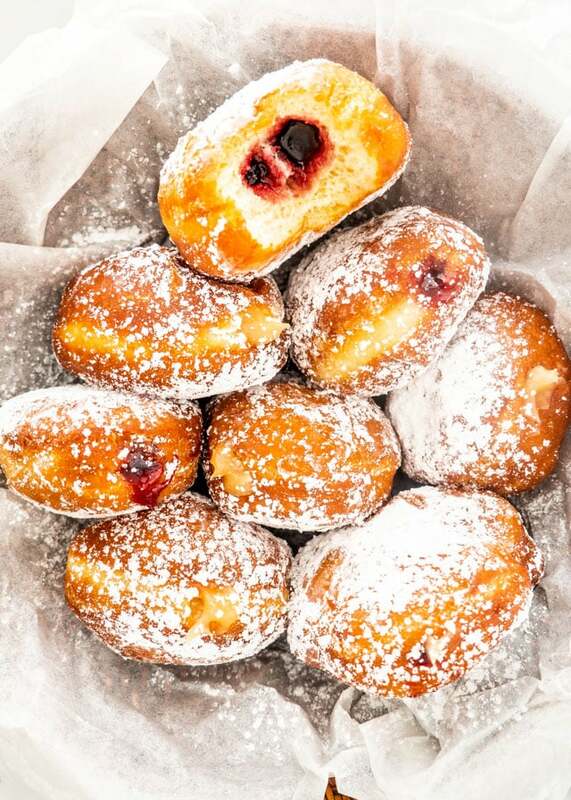 They’re so popular that Fat Tuesday is even sometimes referred to as Paczki Day! And what’s not to celebrate. We’re talking delectable fried treats filled with prune, jelly, lemon or lime curds, strawberry, raspberry, custards, chocolate, or Nutella! If you’ve never tries these before, I strongly urge you to give them a try. Mix wet ingredients: In a medium size bowl combine the eggs, milk, butter, sugar, salt and vanilla extract. Add the yeast and mix well. Make dough: Add the flour to the bowl of your mixer, then pour in the milk/egg mixture. Using the dough hook, mix well until well incorporated. You will know that the dough is done when it comes clean from the sides of the bowl. The dough will be a soft dough. Prepare dough and let rise: Turn over the dough onto a floured surface and knead for a couple minutes, then place the dough in a bowl that's sprayed with cooking spray. I also like to spray the dough with some cooking spray so that it doesn't dry out. Cover with plastic wrap or a clean kitchen towel and let rise for a couple hours. The dough should double in size. Roll dough and cut rounds: Roll out the dough on a floured surface so that's it's about 1/4 inch in thickness. Cut out rounds using a glass or a cookie cutter. Repeat with the remaining dough. Place the donuts on a baking sheet lined with parchment paper and let them rise again for about 30 minutes until doubled in size. 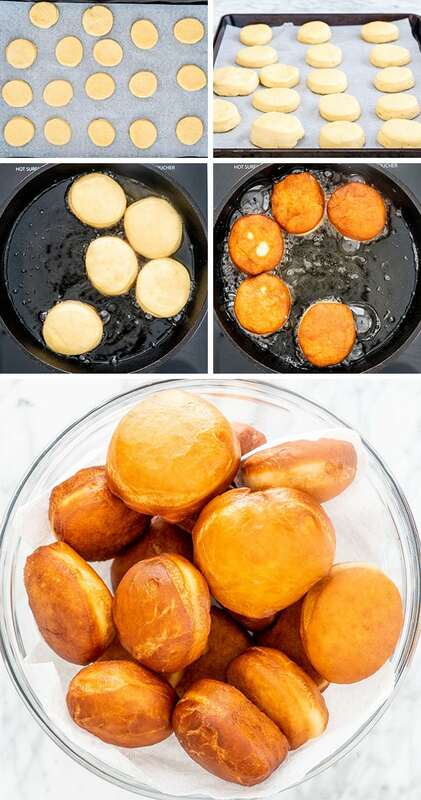 Fry donuts: Add about 3 inches of oil to a deep frying pan, I used a Dutch Oven. Before frying the donuts make sure the oil is hot, it needs to be 350 F degrees. Fry the donuts, about 5 or 6 at a time until golden brown on both sides. Make sure you turn them on both sides to fry them evenly. Cool: Transfer the donuts to a large bowl lined with paper towels to drain some of the excess oil. Allow them to cool until you are able to handle them. 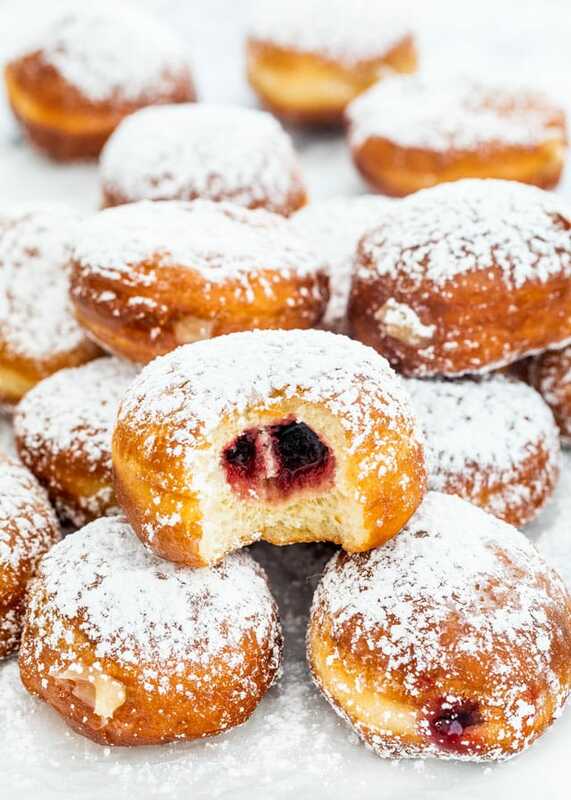 Fill: Using a piping bag and a filing tip, pipe your favorite filling into the sides of the paczki. Roll the donuts in powdered or granulated sugar then serve. These paczki are best the same day they are made. If having leftovers, store them in an airtight container at room temperature for up to 2 days. If using active dry yeast, please make sure you activate it first by dissolving it in a bit of warm water. If it does not begin to froth up, do not continue with the recipe. Subtract the quantity of water used from the milk. When I freeze the Paczki, should I avoid adding fillings and powdered sugar? Yes! The donut will thaw a lot faster than the filling so it’ll be much easier to fill it afterwards. Do you have a good custard recipe for these? Bardzo fajny przepis 😋. Very good recipes. Dziękuję. Thx. Hi, Can you use a bread machine to mix it up? I remember my mother making these. But she never filled them. She would drop them, while still warm, in a brown paper bag filled with sugar. They were so good while they were still warm. Can I avoid the filling part? Poland celebrates an unusual holiday called Tłusty czwartek. The main symbol of this day are sweet donuts with various fillings. It’s not a problem to buy donuts in the store, but it’s much more pleasant and interesting to cook them yourself. Classic Polish bakery Paczki have prune filling. Looks yummy and I really love doughnuts.will have a go at making them . Hi Jo, love your blog!! Plan on making this recipe this weekend. Was wondering where did you purchase the tip you used to fill the donuts? Looks like it works perfectly. Thanks for all the great recipes. The tip can also be found at Walmart. These were seriously unbelievable! I could’ve eaten the whole batch. Thanks! Looks great! Would like to try but can they be baked instead of fried? Trying to stay healthy ?